I know you all have seen some beautiful things here with the newest Shimmerz products - and here is my little contribution. For this Bubble layout I used all 4 of the new products to make the bubbles. To make the 2 colors blend I used a paint brush -- it was so easy! 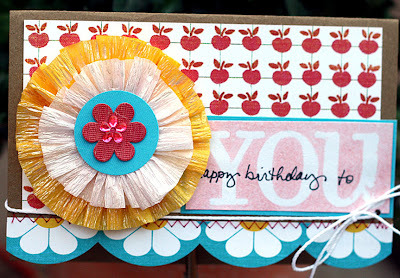 For the card I use a masking technique with the Spritz! It worked perfectly. It is so shiny in real life! Can I get a WaaHooo! Such a great job! :) !!! 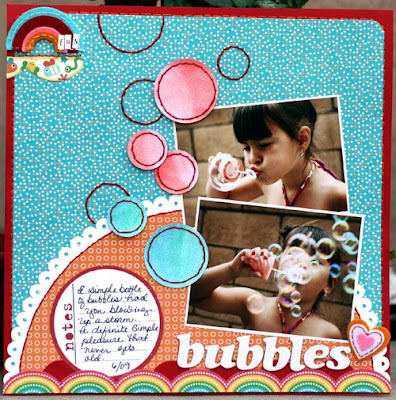 lovin this bubblicious layout- it's so happy! Great use of shimmerz on the card!